Running a service organization without a strategy is akin to sailing a boat without a rudder. Whichever direction the wind blows will be where you’ll end up. In the case of most businesses, clients and sales are the wind which cause the service organization to be in a constant reactive state. This continual mode of reacting creates turmoil, and doesn’t allow the organization to look beyond its immediate customer support offerings and deliver proactive and predictive services. Service sector growth is the main driver in the 21st century global economy. According to world ranking of the top developed nations, services have surpassed industry and agriculture as the main contributors to a country’s gross domestic product (GDP). Savvy corporations have recognized the importance and value of services to their future prosperity. They have multiple strategies in place, including the overall strategy, a marketing strategy, a financial strategy, a pricing strategy and, of course, a service strategy. Historically, companies did not think they needed a service strategy but times have changed and companies must have a service strategy in order to survive. When thinking about any strategy, you should start at the end and work backward, so you don’t constrain yourself with the “how.” Strategic thinking is the thought process of creating a vision; it needs no analysis and includes creating a path toward success by clarifying organizational intent, utilizing internal knowledge and resources, and then factoring in the external environment. You should be able to answer three simple questions about your strategy: Is it a good idea? Is it a good idea for us? Can we execute on this idea better than anyone else? Here are the key components to consider when creating the strategy. Strategic horizon – how far down the road are we going to look? Different industry models exist to help companies build their business strategy. Below are some of the most widely known and used industry models. Each model has its strengths and situations when it is most useful. Porter 5 Forces: a framework for analyzing the level of competition within an industry and business strategy development. Porter 5 Forces (Potential Entrants, Industry Rivals, Suppliers, Buyers, and Substitutes) draws upon industry organization economics to derive the five forces that determine the competitive intensity and therefore the attractiveness of an industry. PESTEL Analysis: a framework of macroenvironmental factors used in the environmental scanning component of strategic management. PESTEL (Political, Economic, Social, Technological, Legal, and Environmental) is a strategic tool for understanding market growth or decline, business position, potential, and direction for operations. Business Model Canvas: a strategic management framework and lean startup template for developing new or documenting existing business models. The Business Model Canvas is a visual chart with elements describing a company’s value proposition, infrastructure, customers, and finances. You will need to determine which model or combination of models best meets your situation. A successful service organization must have both a well-developed strategy and the ability to execute. Effective execution is critical for success. Strategy by itself without execution is just ideas. While many organizations create comprehensive strategies, few are successful at operationalizing their strategic plans with steps to execute the strategy. Building and implementing a service strategy is a journey. The activities involved take time and patience as you lead your organization through a service transformation. 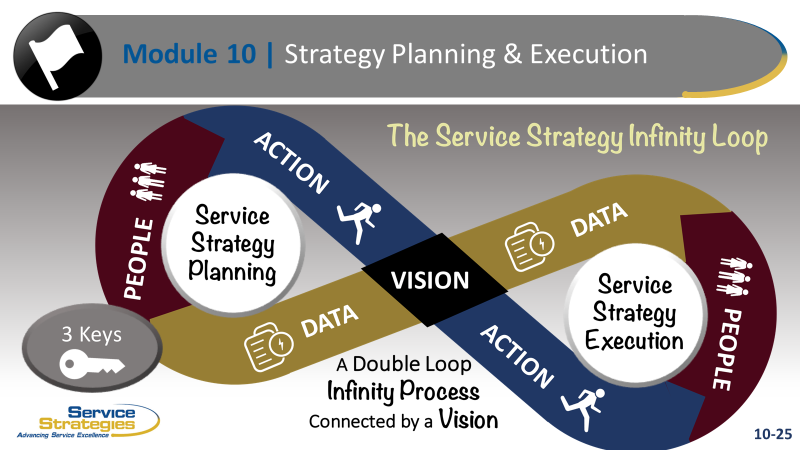 We recommend using the Service Strategy Infinity Process, which is a double infinity loop with planning on the left and execution on the right, connected in the center by the vision. 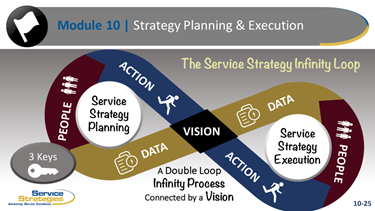 There are three key components required to plan and execute a successful service strategy. The components are Data, People, and Action. Data is essential at the beginning and at the end of the strategy process. Data is required up front to fully access your organization and supply information that is needed for planning analysis. Data is also required at the end of the strategy execution phase to measure your performance and ensure you deliver expected results. People are an obvious core component of strategy planning and execution. As service leaders, how well you leverage employees during planning and execution will have direct correlation to your success. Action is also essential during both the planning and execution phases. Planning is a form of action required before execution. Ensuring that you complete all the activities in your strategic plan is the execution part of “Action” that must take place. Having a strategy allows for breakthrough change and innovation as opposed to continuous improvement. Writing a strategic plan for service will provide a road map to guide the organization and help set clear direction for future growth. This should not be a static document and will need to be updated at least once annually.